From the 'Lamb Collection' at Dundee. I am informed that the castle is no longer the direct responsibility of any Crown Department and is believed not to be open to the public. The castle as it looked around 1912, viewed from the South-east. It is now hardly visible from outside the private grounds in which it is situated except during winter when only its dark outline can be seen amongst the bare trees in winter. A large, recently taken photograph, here. The graphic file is 119k and 640x882 pixels. Some browsers will allow you to see a larger version of the floor-plan graphics below by right-clicking on the mouse and choosing the "zoom in" feature. C.B.E., M.A., LL.D., D.LITT., F.S.A., F.S.A.SCOT., HON.F.R.I.A.S. In the country backing on the coastal plain between Broughty Ferry and Arbroath the declining range of the Sidlaws runs out into a final extension known as the Downie hills, a waste of moorland and bog, rising to a height of between 800 and 900 feet. The southern slopes of these hills overlooking the mouth of the Tay, form a warm, sunny tract of much beauty. This fertile district was settled and civilised at a remote period, and its historical and ecclesiastical associations are considerable. Pleasantly situated on the skirts of these Downie hills, in Monikie parish about a mile east of the old road from Dundee by Kirkbuddo and Dunnichen to Brechin - all places of note in early Scottish history - stands the tall tower of Affleck Castle, one of the most interesting fifteenth century tower-houses in the country. The building is of importance, because it has descended to our own time in perfect condition, neither effaced by ruin nor obscured by repair or alteration. This castle was the seat of the ancient family of Auchinleck - or Affleck of that ilk. 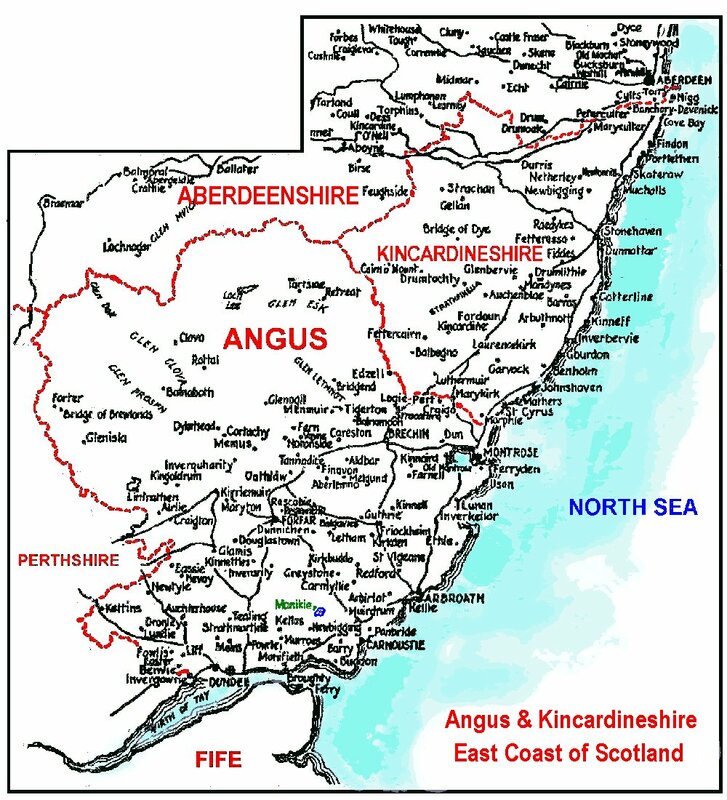 In 1296 Matheu le Naper, of Aghelek, in the County of Forfar, swore fealty to Edward I; but whether this Matthew Napier was the ancestor of the family later appearing as de Auchinlek we do not know. In 1471 James III confirmed a deed subscribed at Auchinlek, 16th March, 1466, by David, Earl of Crawford. In this deed the Earl recites that his grandsire had promised to "renew and declare the auld merchis and landimaris of Auchinlek bath in propirte and in common," but that failure to carry out this pledge had exposed the lands of Auchinleck to "grete hurtis and harmis." Mindful of the good service that the present laird has done to him, the Earl had accordingly commanded the riding of the marches of Auchinleck, which are as set forth in minute detail, so that the boundaries of the little barony can still be distinctly defined. Finally, the document acknowledged that the lands of Auchinleck were held in chief from the Crown at the annual rent of one silver penny. No doubt it was after the ancient family had thus been put on its legs again under the powerful patronage of the great territorial magnate that the present fine tower-house was built. its architectural detail indicates a date in the latter half of the fifteenth century. 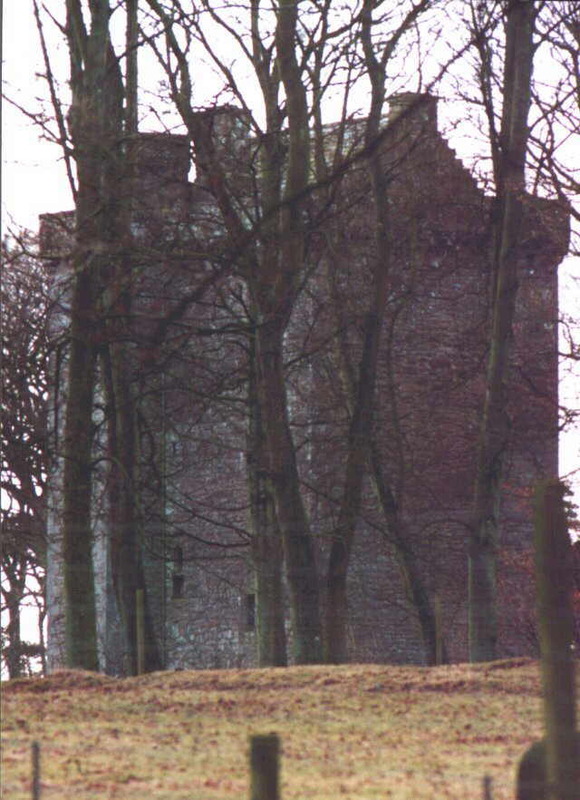 The "castell and fortalice" of Auchinleck is on record in 1501. 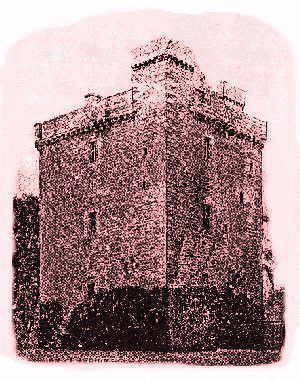 A topographical writer of the end of the seventeenth century has the following note:- "Auchinlek of that ilk a verie ancient familie which hes continued in that name these many generation: ane old high tower house which is seene at a great distance at sea, and is used for a landmark by those that come in the river of the Tay." The tower-house contains four storeys and a garret, and is built on the L-plan, with a "jam" or wing containing the principal staircase. The masonry is in local red sandstone rubble, the stones being generally long and low in the course, and quite irregularly shaped - just as they came into the mason's hand from the quarry. But the dressed work at the angles and at the various openings is all very carefully wrought. The outer door is arched, and above it are the empty panel for an armorial achievement and a very prettily designed tabernacle, or niche for the statue of a patron saint: it has a cusped head underneath a drip stone with rosettes. A number of the upper windows retain their iron grilles, and in these the mode of the intersection is arranged in the characteristic Scottish way, the bars penetrating each other in opposite directions in the four quarters. The present corbelled parapet and angled turrets, which are carried out in fine ashlar work, are renewals of the later sixteenth century, and so too are the crow-stepped gables and the chimney stacks, which have the billet and cable enrichments of that time. Two square open battlemented "cap-houses" or watch posts rise above the building, one on top of the "jam" and the other at the south-west corner. At the ground level the walls are pierced with gunloops of the "keyhole" pattern, which are very characteristic of the period. The doorway is in the re-entrant angle, sheltered by the projecting "jam" and covered by a projecting post on the parapet above. There are at present no machicolations, or openings, between the corbels of this projection, but there can be little doubt that these were present before the parapet was reconstructed. Within the door a short passage gives access on the left to the stair foot, and in front to the cellarage on the ground floor of the main building. This is divided into two by the cross-wall, and is lit only by narrow loops. The cellars are ceiled by the wooden floor of the storey above. This storey is reached by the spiral staircase, and formed the common hall of the castle. It is vaulted, and has three good-sized windows, with stone benches in their bays; but otherwise the room is comfortless enough, having neither fireplace nor sanitation. Above this level the floors are all of wood. The spiral stair continues up to the second floor, which formed the lord's hall. This is a fine apartment. The dais, or low raised platform, on which stood the lord's table, was at the north or upper end, and behind it is a large handsome fireplace. The windows have side stone benches, and beside the entrance is a latrine. At the north-west corner is a large wall-press. At this level the main stair in the "jam" stops, and to reach the upper floors we have to cross the hall to the opposite corner, where another spiral stair ascends to the roof. Thus anybody wishing to reach the battlements would have to cross the hall in full view of the household. Owing to this ingenious arrangement, adopted doubtless with an eye to security, the upper part of the "jam" is available for small chambers. The first of these is reached by a narrow, straight mural stair opening in the east wall of the hall. it is a mere cell, with two loopholes and a nook for a lamp. Off it is a neat latrine, and from this a tiny peep-hole enables the inmate to the little room to keep an eye on the hall below. The floor above the lord's hall contains the solar or withdrawing room, the principal apartment in the castle. This is a room of exceptional distinction, and despite its small size it has few equals in Scotland. The windows are large and finely formed, with stone side benches, and the great fireplace has moulded jambs in the rich style of the fifteenth century. there is a latrine, and there are large mural closets, which might contain bunks, in the north end wall as well as a wall-press at the north-west corner. At the south-west corner, an arched opening admits to a singularly beautiful chapel. This opening is treated as a miniature chancel arch, the jambs having curved bases and moulded caps, while the arch has a wide hollow moulding. On the ingoings of the jambs will be noticed the chases for a wooden screen. Just inside, on the right is a holy water stoup, corbelled out into a heptagonal form, with shields carved in relief upon the sides. One of these shields displays three lozenges. The chapel is vaulted in fine ashlar, and is lit by a charming little window, with a trefoiled head and stepped sole. Against the east wall stood the alter, and on either side there remain in the wall two richly-moulded corbels, no doubt for carrying candles or images. Beside the alter is an aumbry. In the south wall is the piscina, the bowl in which the priest rinses out the chalice after Mass. This is a perfect little gem in its way. The projecting basin is richly moulded, and springs from a corbel in the form of a human mask. Above it is a pointed arched recess, which contained the cruets of wine and water. Over the head of the arch are three consecration crosses. Nothing could be more satisfying than the effect produced by this chapel, and its perfect condition give it an impression of scale that belies its small dimensions. The spiral stair in the south-west of the solar continues up to the battlements. In the cap-house over the "jam" is a small chamber entered from the wall-walk. The battlements on both cap-houses are reached by narrow open stairs. The accommodation provided in Affleck Castle is that of a normal small medieval house: - cellarage, common hall, lord's hall, solar and chapel: but it is up-ended for security reasons, and we therefore see here very clearly how the tower-house is nothing else than an ordinary house with its rooms piled on top of each other on account of the need for defence. There is no kitchen, and the cooking must have been done in an outbuilding within the barmkin wall, by which such towers were invariably enclosed. If need be, the lord's hall fireplace could have been used, but omission of a kitchen is remarkable in a tower otherwise so complete and well furnished in all its parts. The ground height levels of 800 to 900 feet equate approximately as 250 to 275 metres. You can also read more in the OLD BOOK EXTRACTS. The best way to find the various references to items on this website is to use the Site Search Engine.